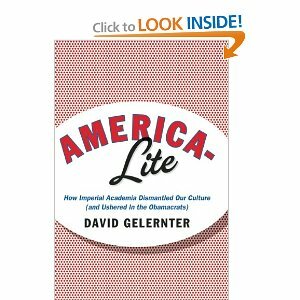 Here’s some strategic conservative wisdom to start off our day compliments of David Gelernter, Professor of Computer Science at Yale and author of America-lite: How Imperial Academia Dismantled Our Culture. Of course, we all know that so many of us Right of Center folks like to stand along society’s sidelines and pompously pontificate about the American cultural scene. And don’t you just love it when conservative commentators shake their heads in absolute puzzlement over the positive polls for the Obama phenomenon? Well, here’s a little perky prod for all you bitching and bewildered bystanders. Surprise is the beginning of wisdom, and President Obama and his campaign so far are deeply surprising. His presidency is a basket case, a failure with a capital F, and yet he is neck-and-neck with Romney. But even more surprising than Obama’s political super-buoyancy is the resurrection of big-government, 1930s-style economic thinking in the Democratic party long after it was taken out with the trash along with Jimmy Carter….The failure of central planning and state-managed economies is one of the big themes of the 20th century. But Obama’s handlers have yet to tell him. One has the impression that most commentators write off the whole question of his surprising political resilience by assuming, implicitly, that race explains everything. But it doesn’t. If conservatives were serious, they would think much harder about the Culture Machine (aka the Establishment) and the ways in which Obama is typical instead of exceptional—typical of a new type of Establishment leader, the new Machine Man. We’re used to old-fashioned political (usually Democratic) machines. But those political machines compare to the modern Culture Machine like a stick of dynamite to an H-bomb. And the congregation shouts, Amen! In this refreshingly judgmental book, David Gelernter connects the historical dots to reveal a stealth revolution carried out by post-religious globalist intellectuals who, by and large, “can’t run their own universities or scholarly fields, but are very sure they can run you.” These imperial academics have deployed their students into the top echelon of professions once monopolized by staid and steady WASPs. In this simple way, they have installed themselves as the new designated drivers of American culture. With academic experts to do our thinking for us, we’ve politely shut up and let second-raters take the wheel. In fact, we have handed the keys to the star pupil and teacher’s pet of the post-religious globalist intellectuals, whose election to the presidency of the United States constituted the ultimate global group hug. How do we finally face the truth and get back into the driver’s seat? America-Lite ends with a one-point plan. This entry was posted in Media/Arts/Entertainment, Political/Social and tagged America-lite, culture, David Gelernter, Democratic Party, Jimmy Carter, obama, Romney. Bookmark the permalink.